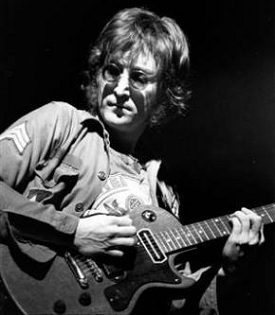 John Lennon’s blend of pop instincts and restless experimentalism set the agenda for modern rock music. His driving, feisty rhythm guitar work energized the Beatles’ early singles, and his imaginative songcraft elevated the three-minute rock tune to an art form. Rock’s first intellectual, Lennon profoundly influenced all of the sixties great guitarist-poets, including Pete Townshend, Ray Davies and Roger McGuinn. To this day, on one level or another, every rock group defines itself in relation to the Beatles. A tireless musical innovator, Lennon was the first electric guitarist to employ feedback on a record (“I Feel Fine” in 1964). He led rock music into psychedelic dream and out into the cold turkey reality of political activism. A painter and writer as well as a musician, Lennon infused rock with avant-garde ideas. He was never afraid to embrace chaos and cacophony. But he also wrote songs that moved the masses.